Since founding the Mad Decent label in 2005, Diplo has utilized it to produce his infamous Mad Decent Block Parties. Each year, the events seem to grow even bigger. The Super Mega Ultra Giant Mad Decent Block Party Festival is set for July 20 & 21, 2019. The event is in Foxborough, Massachusetts at Gillette Stadium (home of the New England Patriots). The festival has a very musically diverse lineup that is stacked with talent. 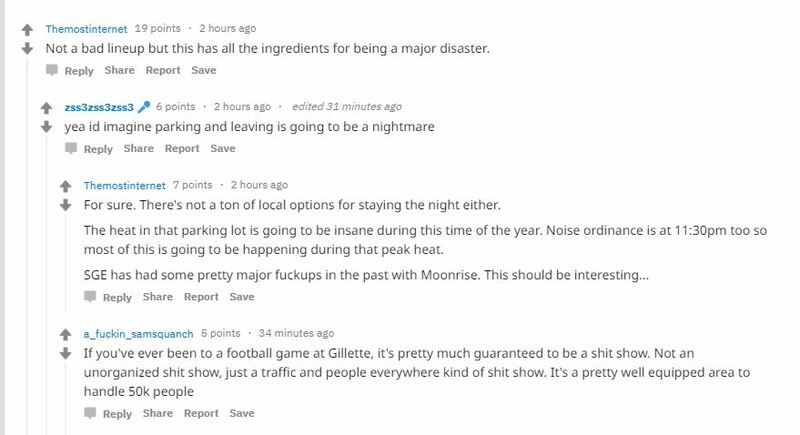 On a Reddit threat, fans are voicing their opinions about the venue and the two-day festival in general. See the photo below for some of these concerns. In addition to the three stages, the event will feature other activities as well. These include “World’s Largest Bounce House” (10,000 sq. ft.), Go Karts by K1 Speed and a paintball arena by Team Dynasty. For more information about The Mad Decent Block Party Festival and its lineup, check out https://mdbpfest.com/.